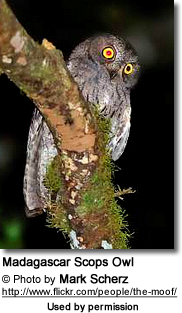 The Malagasy Scops Owls (Otus rutilus) - also known as Madagascar, Rainforest or Ruddy Scops Owls - are endemic to eastern Madagascar, where they occur in primary and secondary moist forest and drier forest to thickets, humid bush country and urban parks - from sea-level up to 6,,600 feet (2000 meters). They are mostly resident (non-migratory) except for some dispersal amongst the juveniles. Range: Comoros Islands situated off the south-east coast of Africa, to the east of Mozambique and north-west of Madagascar. 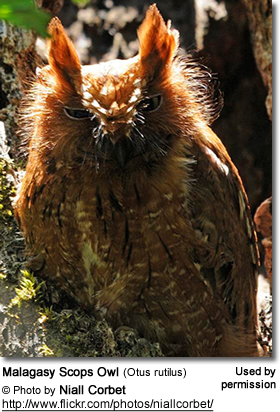 Malagasy Scops Owl are relatively small owls that measure about 8.7 - 9.5 inches (22 - 24 cm) in length (including the tail), with a wingspan of 20.5 - 21.3 inches (52 - 54 cm). 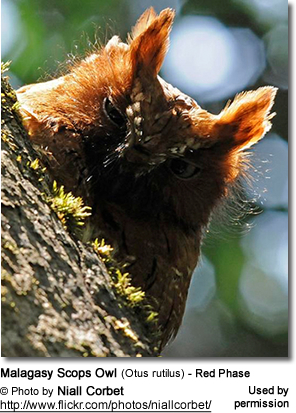 They have short, rounded wings and small, erectile ear tufts. Grey, brown and rufous plumages occur in this race (color morphs). They have pale eyebrows and light spots on the shoulders. 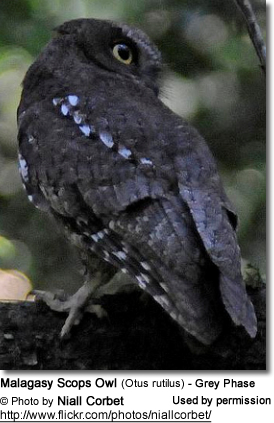 They may have striped markings on the wings and outer tail feathers. The crown and the plumage below are sometimes streaked. The bill ranges in color from dull green to yellow grey, with a black tip. Their eyes (irises) are yellow. They feed on various insects, such as moths and spiders; as well as taking small vertebrates. Hunting is mostly done at night from a perch.